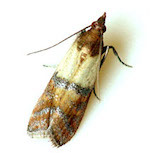 Exopest only treat and control moths that are domestic or commercial pests. 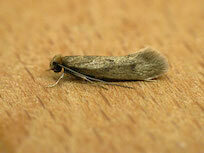 Known as Stored Product Pests or Textile Pest. 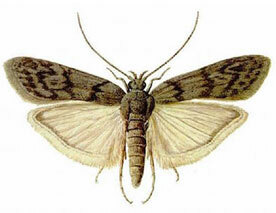 Most Moths in Melbourne are beneficial insects to the environment and our ecosystem. 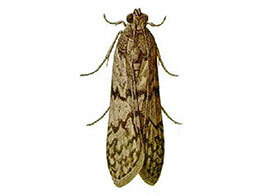 The adult moth has a wing expanse of 20 – 22 mm and when at rest it is 10 – 14 mm long. The hind wings are dirty white while the forewings are blue-grey with transverse dark wavy bars and a row of dark spots at the tip. 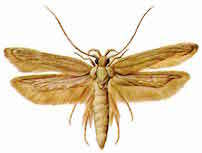 When at rest the wings form a roof over the body and the adult raises its forelegs giving the wings a very distinct slope. 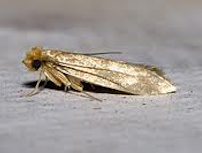 The larvae are white in colour with a brown head and neck shield. 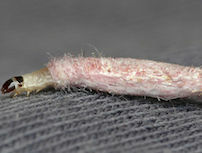 The larvae can take on a pinkish or greenish hue and can reach a length of 15 – 20 mm. 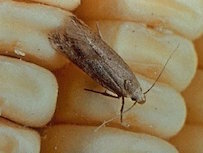 The pupa form a brown, spindle shaped cocoon approximately 9 mm long. The female lays between 100 – 700 eggs (usually 200) in and among the food source and usually fastens the eggs to the infested material. 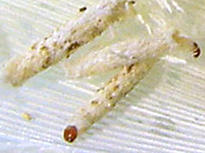 The eggs usually hatch in 3 – 5 days and the hatching larvae produce a lot of webbing. The young larvae confine themselves to silken tubes which are constantly spun. The larva attains full size in around 40 days. The larva pupates in or on top of the infested material (usually flour) or in cracks and crevices nearby. The life cycle can be completed in as few as 4 – 6 weeks but usually takes about 3 months. 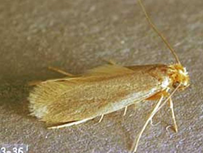 The Mediterranean flour moth is mostly found infesting flour and meal. It has also been found infesting grain, bran, cereal products, nuts, chocolate, seeds, beans, biscuits, dried fruits and other stored foods. It is a pest of mills and warehouses as it can clog machinery with its webs.